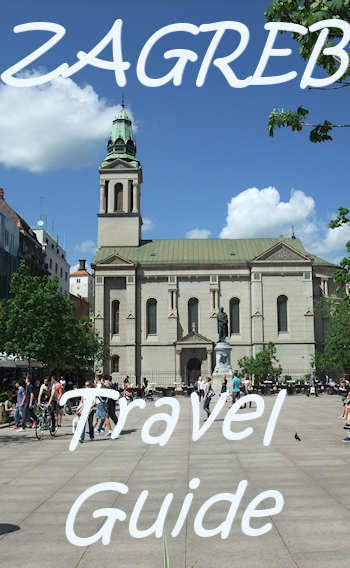 The Zagreb story begins with two hills, Gradec and Kaptol which now encompass Zagreb's Upper Town. Little is known about Zagreb's early history but it appears that Slavs may have built forts and churches on the hills as early as the eighth or ninth centuries. 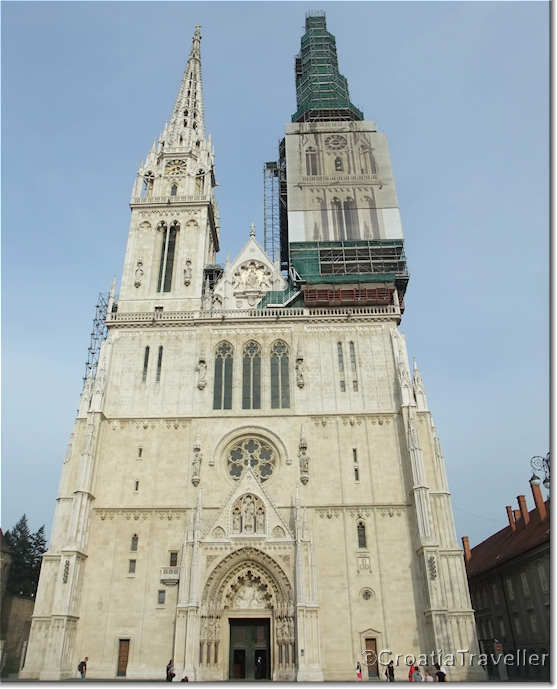 In 1094 the Hungarian King Ladislas established the Zagreb diocese on Kaptol hill and a canonical settlement developed soon after, north of the Cathedral. Another small settlement was developing on Gradec hill, but both settlements were devastated by the Mongol invasion of 1242. Legend has it that the mongols even stabled their horses in Zagreb Cathedral! Mongols swept across the country to Trogir and then abruptly left, leaving a trail of destruction. In order to attract foreign artisans (mostly Germans) to the wasteland, King Bela issued a " Golden Bull" proclaiming Gradec and other towns autonomous royal cities, subject to no one but the king, which freed its residents from many costly and onerous obligations. As an added inducement, he ordered that walls be built around this city, protecting it from any future armies on the rampage. Kaptol remained under the church's jurisdiction, however, which sowed the seeds of a ruinous rivalry between the two towns. During the 14th and 15th centuries the two warring hilltop administrations created havoc as they each sought to protect their economic and political interests. The Bishops of Kaptol would excommunicate the entire town of Gradec, which would respond by looting and burning Kaptol. The two communities put aside their quarrels only when their commercial interests united them, such as during the annual fairs that brought merchants and money to the neighborhood. Unfortunately there were only three big fairs a year--Kermis, Saint Margaret and Saint Mark--lasting two weeks each. In the middle of the 15th century the Turks began making inroads into the region, prompting the bishops to begin fortifying Kaptol in 1478. Thick towers and walls were built around the town virtually under the eyes of the Turks who were camped a few kilometres south on the Sava River. The walls were finished in 1528 and by the mid 16th century the Turks had taken much surrounding territory, but not the two hill towns. 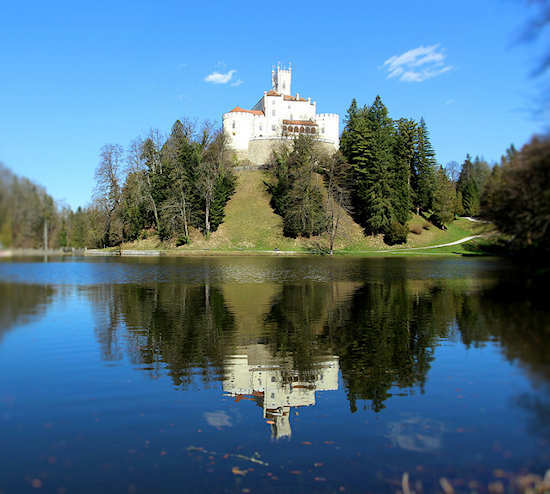 The bishopric at Kaptol lost a number of estates to the Turks however, which cut into its revenue.When a 1609 statute was passed limiting the privileges of Gradec's citizens, the two diminished and perhaps chastened communities gradually merged and became known as Zagreb. 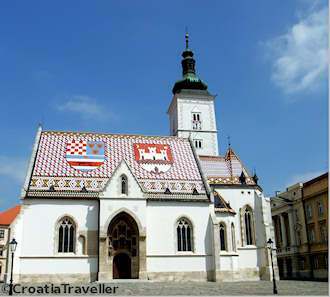 Although Zagreb emerged as the capital of the Croatian State in the 16th century, there was very little left of Croatia that hadn't fallen to the Turks. The commercial life of the city stagnated during the ensuing two centuries of warfare. It was compounded by fires (in 1645, 1674, 1706 and 1731) and plague (in 1647 and 1682). 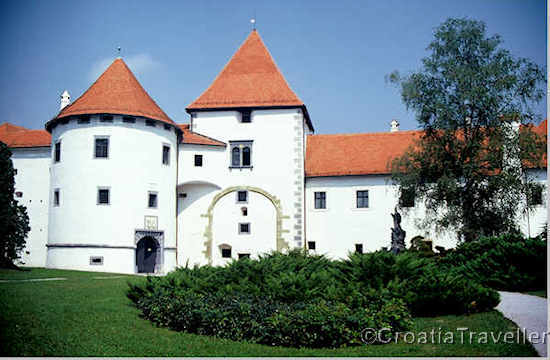 In 1756 the seat of Croatia's government fled from Zagreb to Varazdin, where it remained until 1776. By the end of the 18th century they were a mere 2800 residents, of whom the majority was German or Hungarian. Meanwhile, the plain below the fortified killed towns began to attract settlers. In 1641, municipal authorities decided to move the annual fairs to a larger space outside the city walls. This space now known as Trg Josip Jelacic was chosen for its proximity to both Kaptol and Gradec as well as a source of fresh water, the Mandusevac stream (later paved over). The new marketplace spurred construction around its edges that increased as the Turkish threat receded in the 18th century. The straight streets running south of Trg Josip Jelacic provided an important link between Zagreb and other villages on and beyond the Sava river. 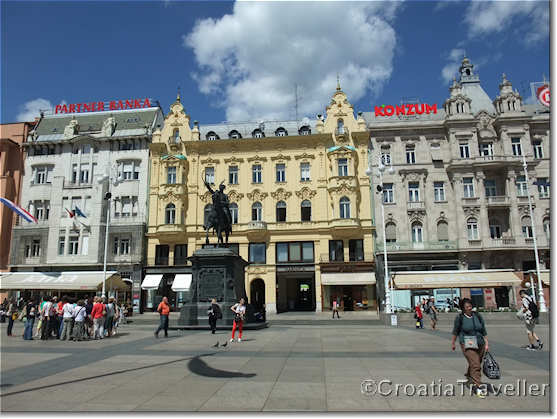 In the 19th century, Zagreb finally matured politically and economically. The population expanded with the development of a prosperous clothing trade in the city followed by a steam mill and a tannery. 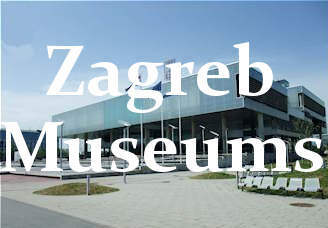 Zagreb became the center for pan-Slavic Illyrian movement that was pressing for self Slavic unification, greater autonomy with the Austro- Hungarian empire, and recognition of the Slavic language. Count Janko Draskovic, lord of Trakoscan Castle published a manifesto in 1832 and his call for national revival resounded throughout Croatia. The city's cultural and educational life also blossomed. The music institute opened in 1826, the first theater opened in 1834, the first opera in Croatian (Ljubavi zloba, by Vastroslav Lisinki) was performed in 1846, the Yugoslav Academy of Arts & Sciences opened in 1866 and the University of Zagreb was founded in 1874 with a Chair in Illyrian studies. Transportation improved. In 1862, a rail link to Slovenia that connected to Vienna was built and in 1870 Zagreb was linked with Hungary. The first public transportation in Zagreb was the horse drawn tram that appeared in the 1891, followed by the electric tram in 1910. By 1910 Zagreb had more than 100 industrial companies, primarily machine building, textiles, food processing and printing companies. The population had reached 60,000 fueling a demand for residences and public buildings. Most of the grand old houses you will see in the lower town were built in the last decades of the 19th century in all variety of styles. Among the outstanding public buildings, note the Croatian Academy of Sciences and Arts, the Arts and Crafts Museum, the Art Pavilion, and the Croatian National Theatre. The "horseshoe of squares and parks that runs from the train station to the town center was laid out from 1865 to 1887 as a public promenade. Croatia and its capital joined the kingdom of Serbs, Croats and Slovenes after WWI. Between the two world wars, working class neighborhoods emerged between the railway and the Sava river and new residential quarters were built on the southern slope of Medvednica mountain. In April 1941, the Germans invaded and Ante Pavelic and the Ustashe moved quickly to proclaim the establishment of the independent state of Croatia with Zagreb as its capital. Although Pavelic ran his state until 1944, he never enjoyed a great deal of support within the capital, which maintained support for Tito's Partisans. In former Yugoslavia, Zagreb clearly took second place to Belgrade but the city continued expanding. The area south of the Sava river developed into a new district, Novi Zagreb, with residential blocks, Pleso Airport and the Zagreb fairgrounds. 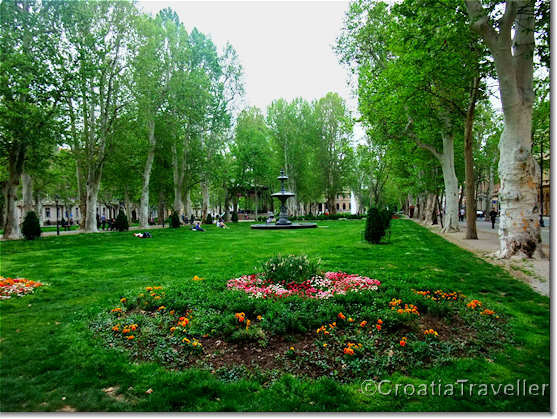 Zagreb was proclaimed capital of Croatia in 1991 when the country declared its independence from former Yugoslavia. For most of the war surrounding the breakup of former Yugoslavia Zagreb escaped damage as it was far from the front lines. In 1995 however, Serb artillery targeted Zagreb with surface to surface missiles armed with cluster bomb warheads clearly aimed at causing civilian casualties. Two attacks on May 2 and May 3 hit populated areas in the Upper and Lower town killing seven civilians and wounding about 200 others. It was the last gasp of a war that was brought to an end by the Dayton Peace Accords in December 1995.